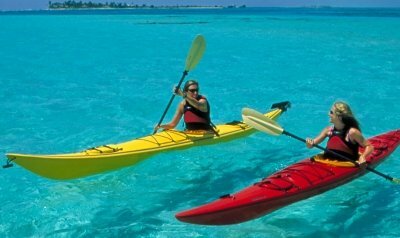 Our most popular Belize all inclusive vacation spends 7 nights at our private Belize island (and 2 in Belize City). We have just put the January 20, 2012 date on sale. The sale price is just over $200 off per person. Visit this page on our website to see all of our Belize deals. All of our prices are per person because we are selling a package, not just a room in a hotel. Our packages include hotels on the mainland before and after the Full Week island trip, transport to and from the island, lodging on the island, 3 meals/day, unlimited beer and soda, national park fees and fishing license fees, and complete use of our sports equipment, instruction in all sports, and daily guided activities all day long. 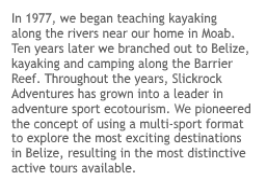 The sports we instruct: sea kayaking, snorkeling, windsurfing, kayak surfing, sport fishing, kayak fishing, stand-up paddling, and board surfing. 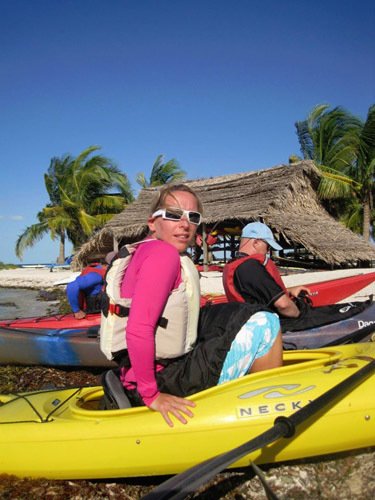 We also instruct scuba diving and kiteboarding for an additional cost. Photo by Sean Smithson, from the November 25, 2011 trip.